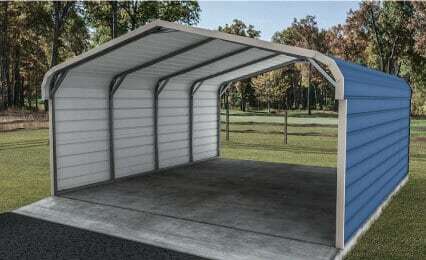 What is the Regular Roof Style for Steel Carports? Enclosed ends to limit the air flow that gets under the roof to create lifting damage. What Makes This Style Different from Other Metal Carports? All other roof styles are based on an A-frame style of structuring the roof. A-frame roofs can be open on the ends, while regular roof metal carports generally require closed ends for stability. Regular roof steel carports tend to cost the least when compared to designs with other roof styles. If you live in an area where heavy snow loads or high storm winds are a concern for any outdoor structure, you definitely need regular roof metal carports. All of the same color options are available for regular roof steel carports, so don’t assume you’re stuck with a specific style of roof just to get the color that matches your home’s siding or roofing. The curved edges of a regular roof metal carport also allow you to locate the structure right next to an existing wall or eave without worrying about a conflicting fit. Can You Add Walls to Regular Roof Metal Carports? As with almost all types of metal structures, you can definitely add walls to enclose any regular roof metal carports. Some homeowners request just one sidewall to block high winds, while others request all four sides fully enclosed to turn an open carport into a basic building. The style of the roof doesn’t prevent the attachment of walls, it just affects how the walls must be attached. It’s generally easier to add walls to regular roof steel carports during the initial design and manufacturing rather than later, but it’s still possible to retrofit this kind of carport. How Else Can You Use Metal Carports with Regular Roofs? For every homeowner parking a car under one of our regular roof metal carports, we have another buyer finding a more unusual use for the same structure. Bump up the height of your usual steel carport and you can park even the biggest luxury RV or motorhome under it. Add some walls, windows, and a door, and you’ve got a workshop ready for finishing out to your desires. Thanks to a streamlined and efficient underlying metal structure, these regular roof steel carports are easily transformed into practically any kind of freestanding building or structure with a little creativity and customization. Don’t just dream about adding a regular roof metal carport to your home or business. Get in touch with us today at MetalCarports.com to request a quote or to find out more about the steel carports we offer.